This red velvet buttercream frosting is made with cream cheese and added mini chocolate chips. 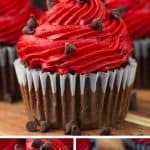 This recipe makes a beautiful bright red icing and is perfect on vanilla or chocolate cupcakes for Valentine’s day. It’s the best way to get that red velvet taste in a frosting. I love the taste of red velvet cake, but I really wanted to see if I could recreate that taste in buttercream. Maybe it’s purely psychological and it’s just the pretty red color messing with my mind, but I don’t think so. 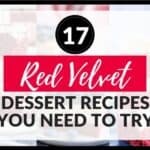 Red Velvet has a distinct flavor to me. You know, just the hint of cocoa with a slight bit of tanginess. For me, red velvet is pretty much perfection. 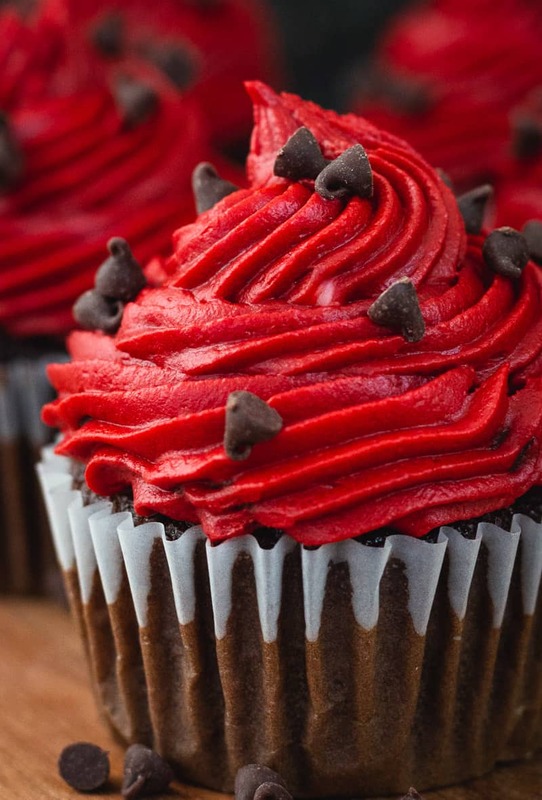 I mean, what could be tastier and prettier,then deep red buttercream on a nice chocolate cupcake? There are a couple things to note about the ingredients in this one. I’m using cream cheese in this buttercream, because it gives a hint of tanginess, just like the vinegar does for a red velvet cake. If you don’t want to go for the red velvet emulsion, just add in the same amount of vanilla extract. I also added in mini semi-sweet chocolate chips, because I like the flavor and texture they add to the buttercream, but you do you. The red velvet extract is optional, but it really kicks up the flavor. You definitely want to use gel food coloring and not the liquid kind from the grocery store. 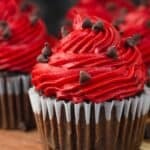 It takes too much of the liquid food coloring to get a deep red and will add too much liquid to your buttercream. Americolor gel food coloring works very well and will give you a pretty red tone. Wilton also makes a ‘no taste’ red food coloring. It has a slight more orange look to it. See my comparison here: Coloring Dark Buttercream I think the Americolor looks best and I haven’t noticed any weird taste to it. The added cocoa powder would help with that anyway. 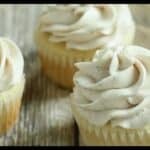 You don’t have to add in the mini chips, but I think it adds a nice taste and texture to the buttercream. If you’re piping this on cupcakes or a cake though, either forego the chocolate chips or just use a very large open piping tip. I used a Wilton 8B tip and it worked fine. If you use a smaller icing tip, the chocolate chips can get clogged when you’re piping. 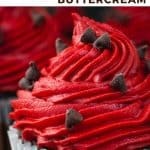 This is a bright red buttercream, so understand that when you eat it, your mouth will be red and your hands as well. You wouldn’t want to eat it right before say a job interview. 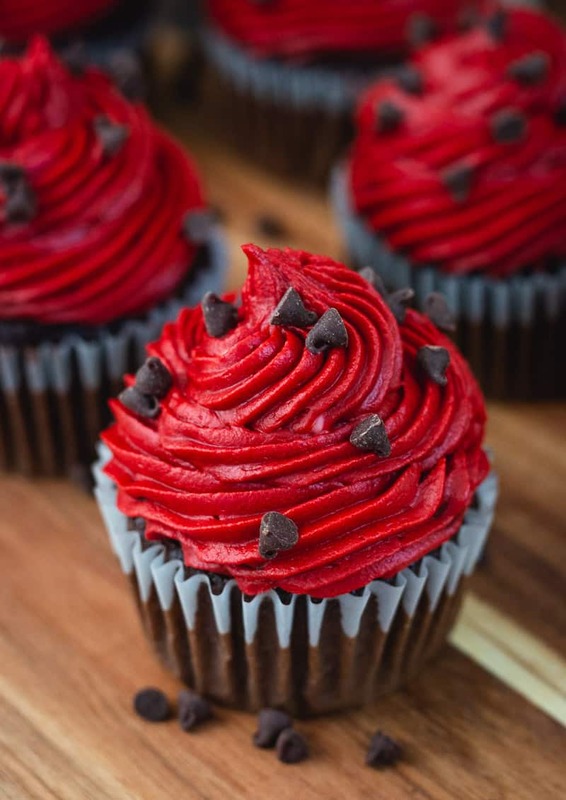 This red velvet buttercream frosting is made with cream cheese and added mini chocolate chips. 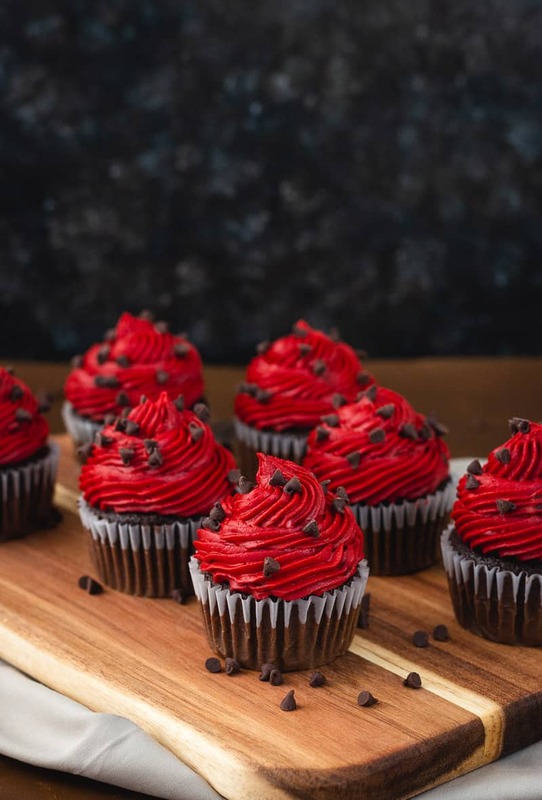 This recipe makes a beautiful bright red icing and is perfect on vanilla or chocolate cupcakes for Valentine's day or any day you want! Make sure your butter and cream cheese are softened. They should be a little cooler than room temperature. (The cream cheese can be a little colder than the butter.) Don't microwave them though. Add the butter and cream cheese to a bowl and beat very well on medium to medium/high speed until creamy. Scrape down the sides of the bowl and beat again until well mixed. Add in the cocoa powder and mix well. Scrape down the sides of the bowl and mix again. Add in three cups of confectioner’s sugar plus the salt and one tablespoon of milk or cream. Beat on low until incorporated and then medium until well mixed. Add the last three cups of confectioner’s sugar and mix on medium until well incorporated. Scrape down the sides of the bowl and mix again. Add in two teaspoons of the red gel food coloring and mix on medium to medium/high until well mixed. Add more food coloring if needed and scrape down the sides of the bowl, then mix again. Do this until you reach the desired color. Now, check the consistency. If it’s too thick, add another tablespoon of milk and mix again on medium. If it's too thin, add in another cup of confectioners sugar. Adjust the coloring if needed. This buttercream needs to be kept in the refrigerator as it contains cream cheese. It can be kept chilled in the refrigerator for about a week and frozen for several weeks. 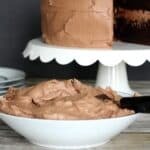 This recipe makes enough buttercream to cover a two layer, 8 inch cake or approximately 24 cupcakes. You definitely want to use gel food coloring and not the liquid kind from the grocery store. 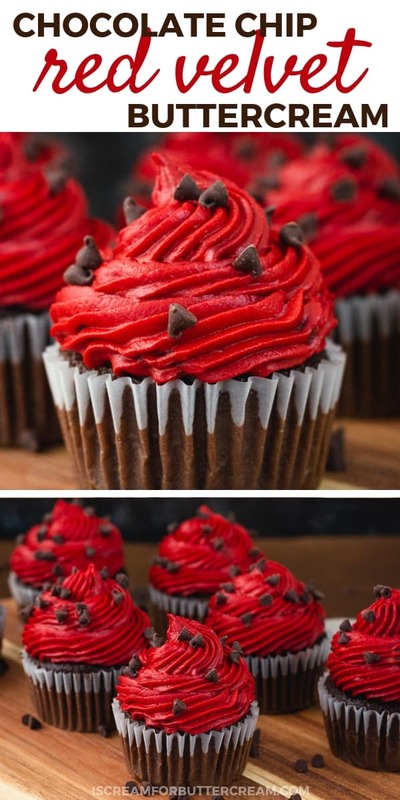 It takes too much of the liquid food coloring to get a deep red and will add too much liquid to your buttercream. Americolor gel food coloring works very well and will give you a pretty red tone. Wilton also makes a 'no taste' red food coloring. It has a slight more orange look to it. You don't have to add in the mini chips, but I think it adds a nice taste and texture to the buttercream. If you're piping this on cupcakes or a cake though, either forego the chocolate chips or just use a very large open piping tip. I used a Wilton 8B tip and it worked fine. If you use a smaller icing tip, the chocolate chips can get clogged when you're piping. 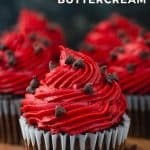 This is a bright red buttercream, so understand that when you eat it, your mouth will be red and your hands as well. 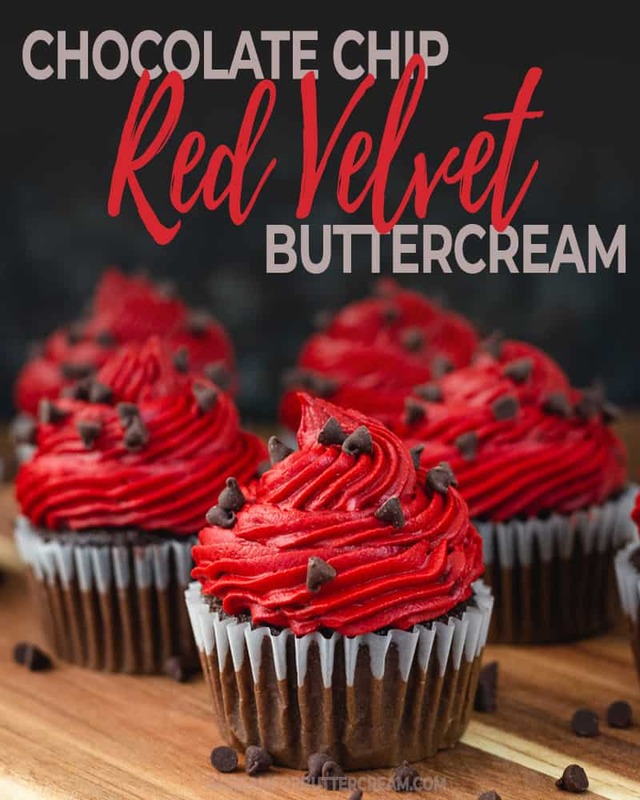 GET THE FREE DESIGNED RECIPE CARDS FOR THE RED VELVET BUTTERCREAM PLUS THE PASSWORD TO THE RESOURCE LIBRARY. Just fill out the form below! I really hope you enjoy this one as much as I do! WANT TO SAVE THIS? CLICK HERE OR ON THE PIN IMAGE BELOW TO SAVE THIS POST TO YOUR FAVORITE BUTTERCREAM RECIPE PINTEREST BOARD. Question about your ingredient list. The lists states 3/4 cup butter (3 sticks). 3 sticks of butter = 1 1/2 cups butter. That’s a big difference. Please verify as this looks like a beautiful recipe that I want to make. Oh my goodness, I totally typed that wrong! Thank you so much for letting me know! Sometimes you can proofread a gazillion times and still miss something. It should be 3 sticks, which is 1 1/2 cups. I’ve corrected it in the recipe. Thanks so much!